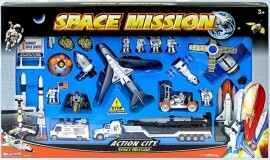 Space Exploration playset - spacekids - space toys, dressing up costumes, kids spacesuits, astronaut food, cool space stuff! 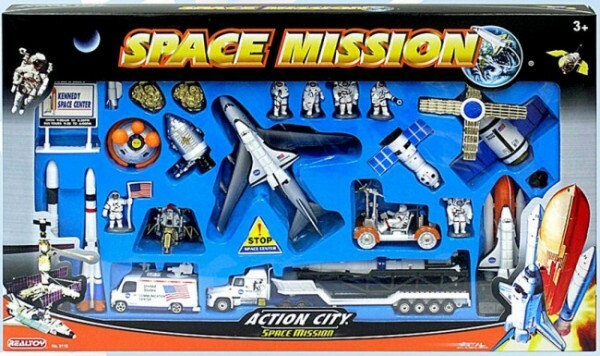 A really comprehensive playset containing some great plastic play models, plus a couple of die cast vehicles including a rocket transportation truck and a mission control van. Includes two shuttles, one on its launch rockets, the other on the Boeing 747 Shuttle transport plane. Also included are models of NASA's Skylab space-station, the Apollo command module, Lunar Lander, Lunar Rover Moon car, and the Apollo capsule depicted with its landing buoyancy aids deployed. There is a Soyuz capsule, three rockets - a Soviet Vostok, Saturn V and a US Ares (not all to scale), six astronaut figurines (approx 3cm high) asteroids and space centre signs.